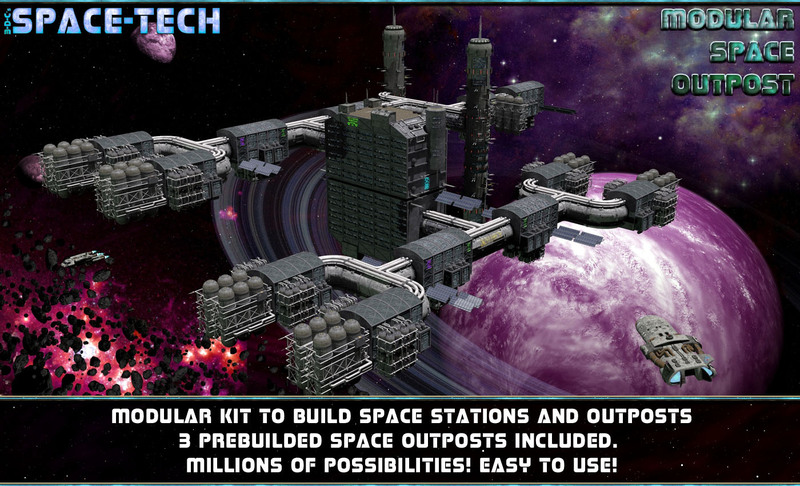 This Pack will bring you a SpaceTech Landing Platform. or mountain to build a landing platform you need. Light Sets for Day and Night settings included. Join our Spacetech Series and discover more technical Space elements! Rem. : Item is build for Poser, loads OK in D/S with a few limitations, check readme file for more. 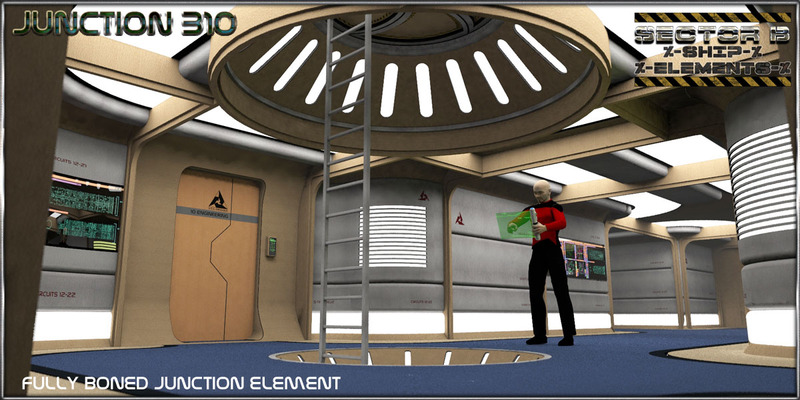 Herewith you receive part 7 of our Ship Elements D-Sector series. 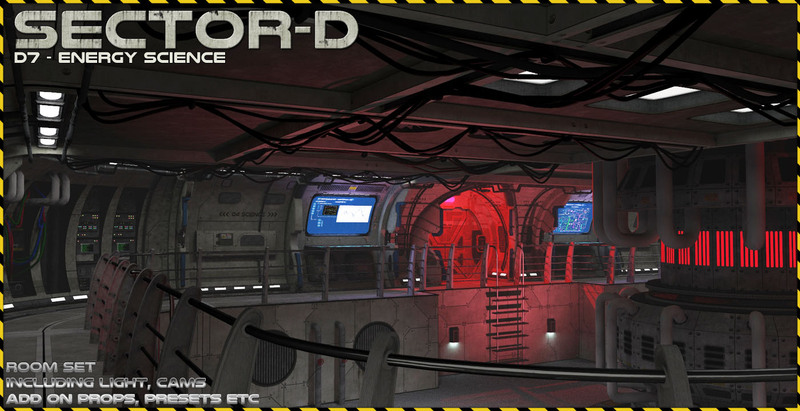 D7 brings you a technical energy science room build with a energy clutch in the middle. get a room with a huge in-ground area with a hole in the bottom and ceiling. Comes as usual with full light sets, cam presets and full scene file. All Doors, Panels, Cabinet Doors etc have a masterdial in the body to animate. alien impact such as shown in the previews. rem: Build for Poser, loads OK in D/S with a few limitations. doesnt look as too new and shiny but something that would be working with the SpaceGate Product and Space Station Outposts from me. 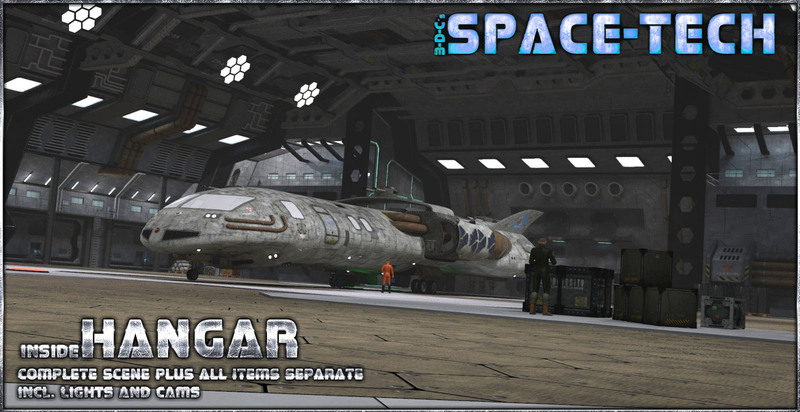 The hangar you receive in this product is large enough to hosts ships such as like the Rapita or multiple smaller ships at once. It is build with detail but still leaves you enought capacity to put enough people and ships into your scene. The Product is build of separate props mounted to an overall structure holder so you can easily disassemle items or remove them if not needed. Walls contain morphs to open and close doors. 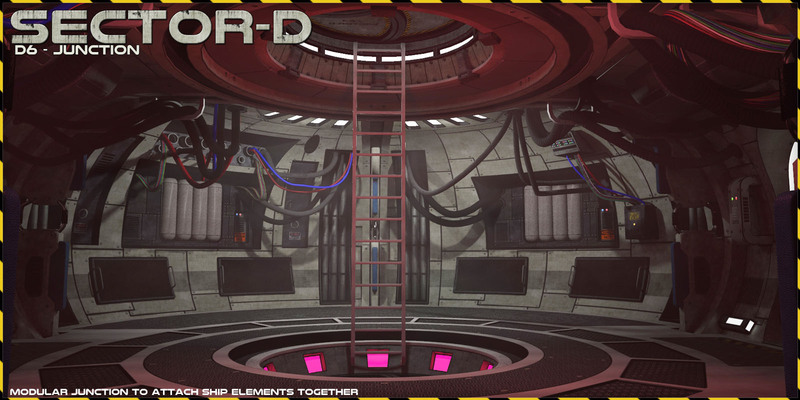 The doors at the side mount to the Ship Elements D-Sector Series. 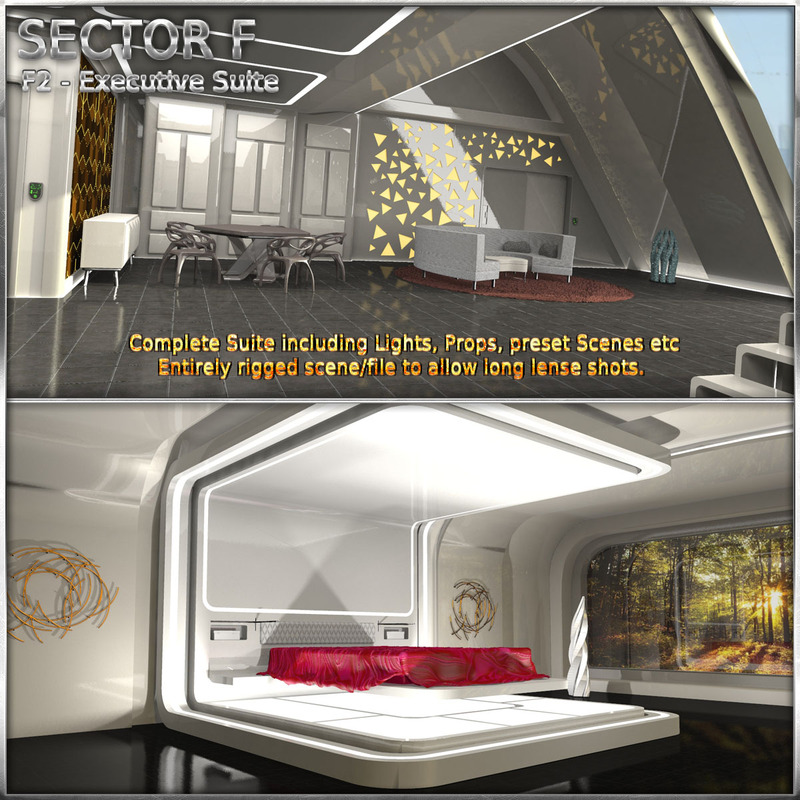 Included in the pack are light sets and camera presets as well as a preset scene. – All props as single items: Sidewalls (with and without Doors), Frontwall, Backwall, Sideback Walls, Sideback Up Walls, Panels, Main Door, Floor etc. 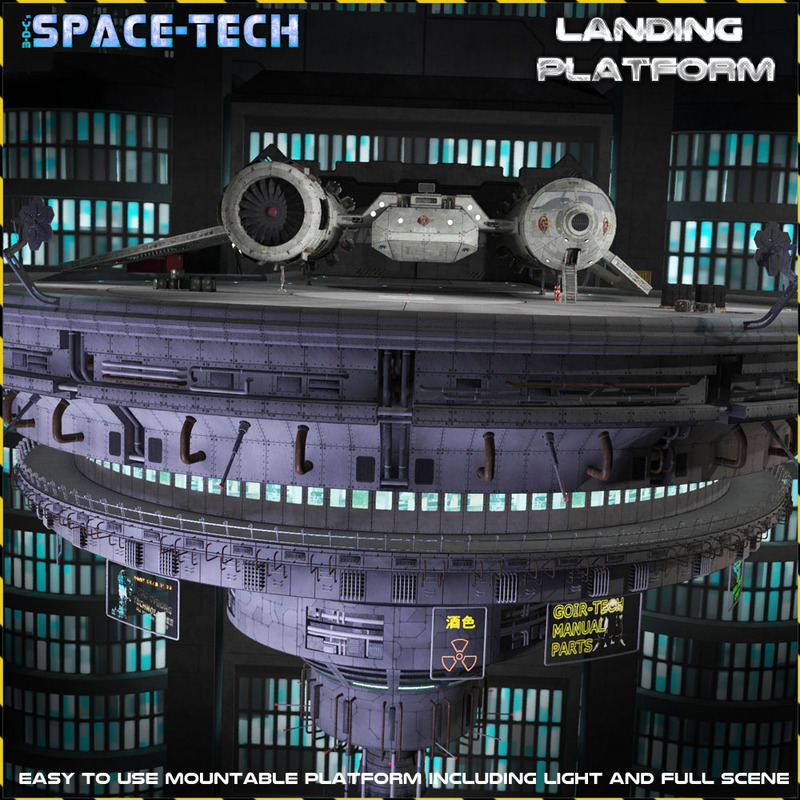 check out our other SpaceTech and SpaceCraft Items and our huge store and freebie area. designed to offer your space exploration some content with balance to detail and memory/ease to use. Thanks for using our sets and check out our large freebie section and other items of our store. Rem. : This set is build for Poser, works out OK in D/S; check readme for further information. This set will bring you our first JumpGate. The model is a rigged item, Hangar doors can open, Hyperdrive enabled / Disabled. 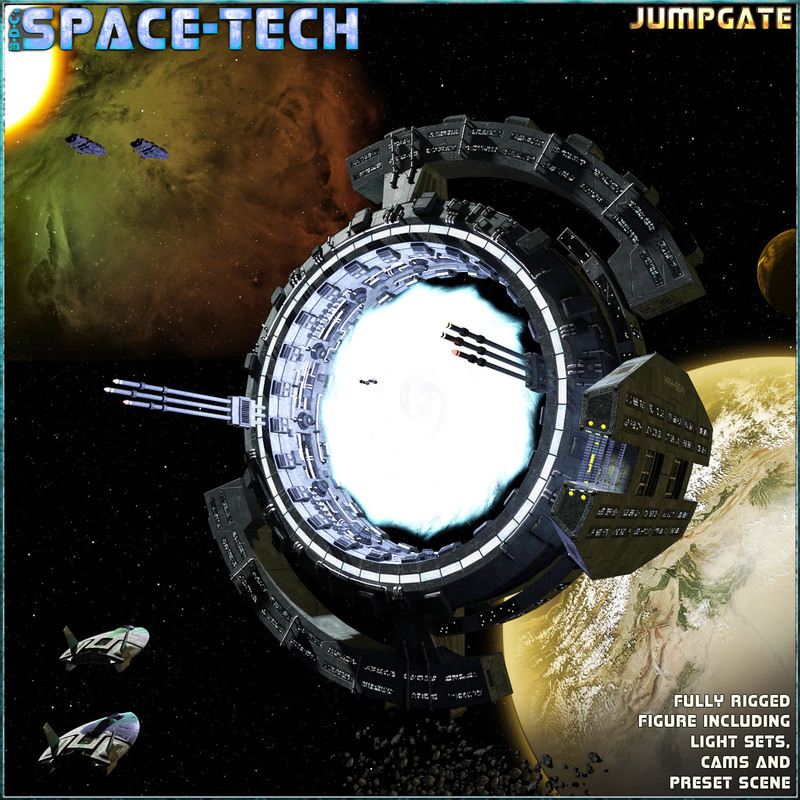 Jumpgates and therewith the ability to travel far-overlightspeed to more distant places have played a large role in exploring the patch. Before „carry-on“/in ship build jumpdrives had been invented, the jumpgates had been the only way traveling to other systems. The first series of gates where build by Depretch-Systems, however had issues with stability and didnt really last to long. Over the last decades, the newer series have been much better in stability and have as well been used majorly as trading stations since they are often located in key areas in the patch. Jumpgates still rule spacetravel as an indispensible asset hence they can directly harvest sun-power (which is why they are located close to a star) to convert mined Kra-Tan ore to jump capable Kra-Tan liquid. In-Ship jumpdrives have their limits in regards to distance due to the limited amount of ore they can convert and carry. Jumpgates dont and therewith can offer far wider distances to travel. In most systems, there are certain fees charges for jumping, however, given the alternatives of long-hauling spacetravel, they are often still cheaper than accepting alternatives. Most Jumpgates have two or more hangars and host around 2000 or more citizens. 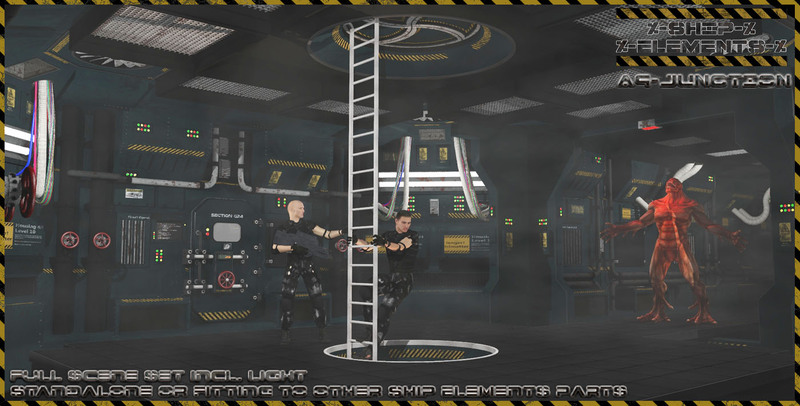 Most of them are freelancers or miners that use the jumpgates as interim stations during their explorations. Most jumpgates run trading facilities and markets. So they are a good place to stop by and sell some of the stuff you may have collected during your explorations. Here comes F2, the Executive Suite. this suite definitly is excslusive. You will easily make yourself a home here. Full light sets for day and night included as well as preset cams for Dolly Cams. Thanks for using our sets and check out our great freebie area and lots of add-ons. Welcome to our A9-Junction Set. to another level set of the A-Series. This works of course as well as a stand alone item. The room is a completly rigged figure to allow you to disable wall sets. All three main walls can be changed to door walls as well. All doors open through masterdials. Rem. : Set is build for Poser. Loads in D/Z, check read me for limitations. Check out our other sets and our great freebie area! thanks for using our sets. Here comes our Junction Element, build for the D-Sector this time. but work also as a standalone or can connect to a junction of the same kind (ie to get you to another level). Junction D comes as usually with lights and preset scene. Build for Poser. Works in D/S with a few limitations (see read me). Check out our other Ship elements series items and our freebie area for lots of add ons and stuff. Here comes our Junction Part for the B-Sector! Series. The room comes as a fully rigged element so you can disable wall parts to make long focal length shots. Setup to render best with object based lightning support (Poser 8+). Doors open through masterdials in the Body Section of the room. Align with other junctions of the Ship Elements Series. Climb for B-Sector to D-Sector? No problem at all! Thanks for using our sets and check out our large freebie area for more stuff. Rem. : Pack is build for Poser. Loads OK in D/S with a few limitations (check read me). Here is the long awaited D5 part of the Ship Elements D-Sector Series. moving parts in here and the versatility has never been greater. 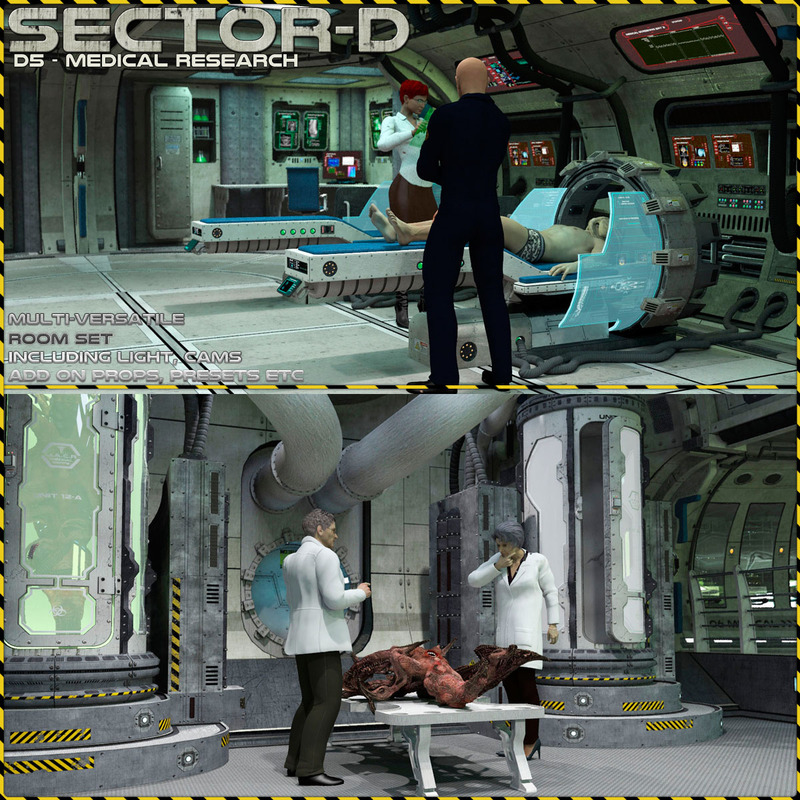 Like usual, we have included a preset scenes so you are ready to go. Check out our large freebie area for more add ons and stuff.